Avoid waiting in lines. Have your item appraised online. If you wish to pay for an quick online appraisal to just get a sense of value send $10 to appraisalday@gmail.com via PayPal. Then simply email your pictures and descriptions to the same email address. The online appraisal is a quick and easy way to see if you need to spend more money on a formal written appraisal which costs $150 per hour or more. In most cases written appraisals are not needed. You can also use our new free feature to post your items for sale on this website! 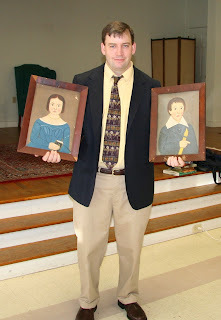 Paul finds two iconic folk art portraits at an appraisal day for a church fundraiser. They were almost thrown in the dumpster by the family that brought them in. He told them "thank God you saved them!" They were value at over $30,000! Antiquities, Ivory, Picasso, Chagall & Salvador Dali signed prints, sewing machines, signed prints, stamps or sports collectibles. Do not physically send items in for review unless prior approval is made. AppraisalDay.com is not responsible for items sent in mail without authorization. Please review our Terms of Service. By submitting an item you accept these terms.